Cebu Pacific Promo Fares 2019 to 2020: Cebu Pacific Promo Fares 2014: Cheapest Fare at 399 for Domestic Flights! Cebu Pacific Promo Fares 2014: Cheapest Fare at 399 for Domestic Flights! 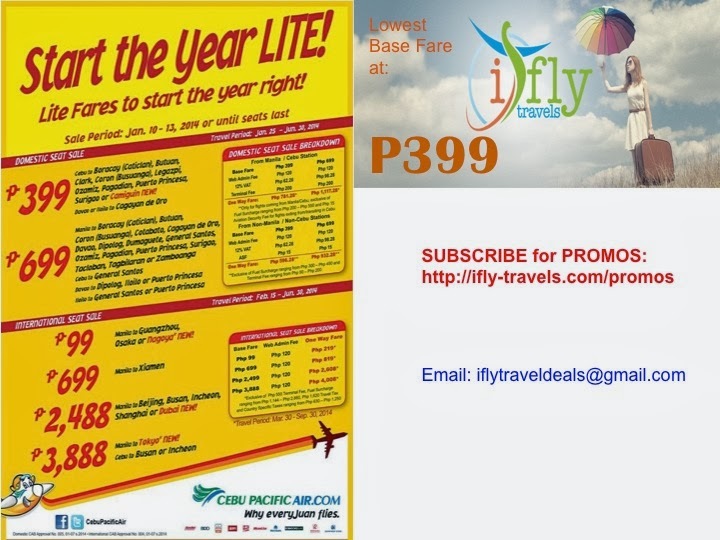 Cebu Pacific Promo Fares 2014: Start the Year LITE! Lite Fares to start the year right! Our latest #CEBseatsale starts now. Visit http://www.ifly-travels.com to book your next flight today! P3888- Manila to Tokyo* NEW! For flight inquiries, we would only prioritize those who filled our BOOKING FORM online (http://www.ifly-travels.com/book-flight/). We will try our best to respond to all inquiries. Kindly note that we have tons of emails to deal with. FIRST COME, FIRST SERVE basis only. We can give you you the cheapest fares you can get from all airlines. For any doubts, pls. refer to our website's FB page: (https://www.facebook.com/media/set/?set=a.217979661710697.1073741829.181913668650630&type=3) for all SUCCESSFUL bookings done through our online ticketing system. We are charging a VERY MINIMAL processing fee only. We are in NO WAY connected to Cebu Pacific or any other airlines local or international. This blog serves as an INFORMATION blog on all Cebu Pacific PROMO fares only. We are a team of 5 frequent travelers/bloggers based in Cebu City.